The question is whether Microsoft will be successful in shifting to this new computing model? Microsoft’s problem is not that it has difficulty offering an operating system for tablets. The problem is that the economics of both systems and application software on tablets is destructive to its margins. A PC has for several decades been “taxed” with a Windows and Office license. The exact figure is imprecise because of subscription accounting used by Microsoft, but we can take Microsoft revenues for Windows and Office and divide by PC shipments to get an average. 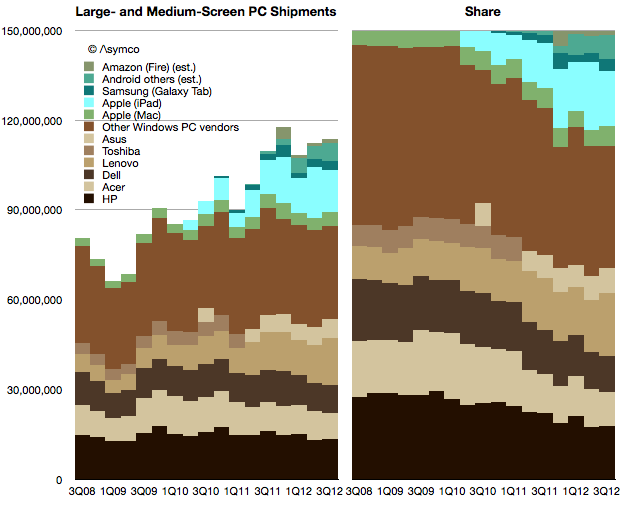 This view shows how Windows revenues per PC have held steady for the last three years and Office have moved up slightly. In the latest quarter Windows “captured” $52 per PC shipment and Office “captured” $67. The problem for Microsoft is that pricing systems software at $50 and a suite of apps at $67 for a tablet that costs $200 to the end-user is prohibitive. Firstly because an OEM could not justify paying $50 to Microsoft while competing with another vendor whose (Android) software license costs nothing. It implies an increase in his bill of materials without the ability to charge more for the product and hence a reduction or elimination of margin. The economics of tablets imply a “commoditization” of system and application software. So what’s Microsoft to do? The answer is Surface where the software margin is captured in hardware. This explains the pricing of Surface. The price isn’t significantly below what Apple charges because Microsoft wants to capture a comparable (30%+) margin. On a $500 product that amounts to $150. After subtracting hardware operating and distribution costs we can get pretty close to the $120 it currently obtains from a PC. This also explains the lack of appetite for “partnerships”. OEMs which would normally compete on hardware would have to deal with zero margins (or less) after license fees and would be encouraged to cut corners and shave costs, compromising the experience and causing the platform to suffer. Microsoft does not like the phrase “post-PC” because it implies the end of its hegemony. They like to think of the PC becoming a new form factor in which they have the same role they’ve always had. However, looking beyond the form factor we see that mobility itself is disruptive in the implied modularity of the PC. Device economics offer the explanation for an otherwise perplexing Surface strategy. 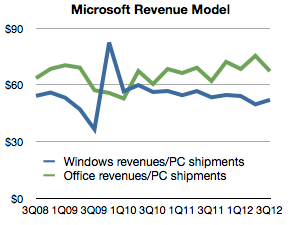 The question remains how many Surface units could Microsoft possibly sell to maintain its revenues. A “tax” is implied only when purchases are mandatory.